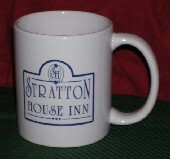 Two coffee cups are available, which feature Stratton Mill or Stratton House designs. 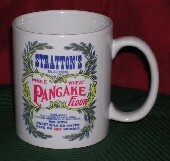 Both are 11-ounce white stoneware cups with designs printed on two sides. The difference in cost (see below) is related to the complexity of and number of colors used in the designs. Shipping and handling are extra. To place an order, please see: Place an Order on this Website.